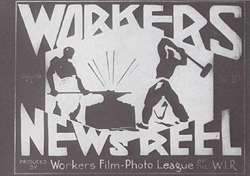 The Worker's Film and Photo League (later known as The Film and Photo League) was founded in 1930 and sponsored by the Communist International. It was a section of the Worker's International Relief (WIR), the American chapter of the Internationale Arbeiterhilfe (IAH). IAH's purpose at first was to provide support for labor strikers and their families, but its influence extended throughout the twenties to organize drama groups, dance troupes, and a WIR film group, "Friends of Soviet Russia," which distributed film documentaries demonstrating the non-Hollywood version of the Soviet Union. WIR also produced documentaries on the Communist-led strikes in New Jersey and North Carolina, in 1926 and 1929 respectively. The New York FPL started with Brody, Lester Balog, Robert Del Duca, and Leo Seltzer. Membership grew, at one point reaching a hundred, to include progressive artists such as Lewis Jacobs, Leo Hurwitz, David Platt, Irving Lerner, Ralph Steiner, and others who held Hollywood productions in contempt. The FPL set about obtaining real-life footage for use in newsreels. 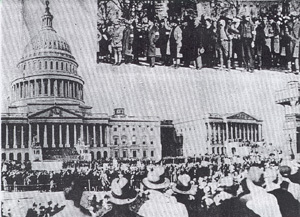 The bulk of its productions were quickly edited news footage, which was shown by League members at union halls, worker's clubs, and during strikes. National Hunger March WFPL still photo. By 1936, the FPL was dissipating. Support from WIR faded as the IAH was annihilated by the Nazis. Without funding the group struggled to produce its final film, Getting Your Money's Worth, in 1937. A section of the FPL, the Photo League, remained to produce still photography and another arm, the Associated Film Audiences, continued to post reactions to Hollywood right-wing productions. Three members of the FPL split from the group in 1934 to create their own radical productions. This league was known as "Nykino," an abbreviation of "New York Kino." Willard Van Dyke joined Nykino in 1935, the same year that he and Strand visited the Soviet Union. Pare Lorentz soon hired Strand, Steiner, and Hurwitz to photograph The Plow that Broke the Plains. The experience of making Lorentz's film inspired the Frontier Films script and production of Hands, a work displaying close-ups of hands idle until launched into action by the WPA. In 1936, Dutch film maker Joris Ivens came into contact with Nykino. Ivens "became a powerful influence in the group's commitment to independent, left-wing documentary production and his films...exemplified to them an aesthetic which transcended the reportage basis of Film and Photo League work, while avoiding the thematic impersonality of a government product like The Plow That Broke the Plains". 7 Although Nykino strove to attain this aesthetic, its productions Pie in the Sky and The Wave fell short. The first plans of the group actually included adaptations of plays and the continuance of The World Today. These projects were aborted, in addition to some other projects, due to lack of financial support. Four major productions were finally completed including: Heart of Spain, based on Spanish Civil War footage, China Strikes Back, edited from scenes obtained by Harry Dunham in northwest China, People of the Cumberland, Frontier's first original domestic production, and Native Land, known as the group's most culminating achievement. Dissention was present in the group however and in 1938 Steiner and Van Dyke left Frontier Films to form American Documentary Films, taking the half-finished documentary The City with them. Despite lack of funds and loss of members, Frontier Films went on to produce additional, although less well-known films, including History and Romance of Transportation, released for the 1939 World's Fair, United Action, edited by Frontier Film members, and White Flood, an aesthetic look at the last ice age. Towards the end of the decade, Frontier Films was issuing trustee certificates to pay the bills, and despite the sympathetic support of Eleanor Roosevelt, the break-out of the war was too much for the company. The organization disbanded in 1941 and most of its members became actively engaged in war efforts. As Russell Campbell points out, "The Depression decade was over, and it would be many years before committed, left-wing filmmaking collectives like Frontier Films would be seen again in America." 10 It would also be several years before the radical films from this era were again brought to life. 1 Campbell, Russell. "Radical Documentary in the United States." Thomas Waugh, Ed. Show Us Life: Toward a History and Aesthetics of the Committed Documentary. Metuschen, New Jersey: The Scarecrow Press, Inc., 1984. (72). 2 Barsam, Richard M. Non-Fiction Film: A Critical History. Bloomington and Indianapolis: Indiana University Press, 1973. (146). 6Campbell, Russell. Cinema Strikes Back: Radical Filmmaking in The United States 1930-1942. Ann Arbor, Michigan: UMI Research Press, 1978. (118).